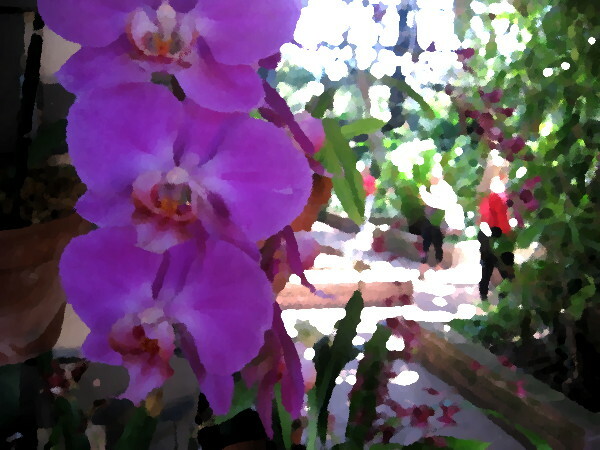 art – Beautiful Balboa Park! 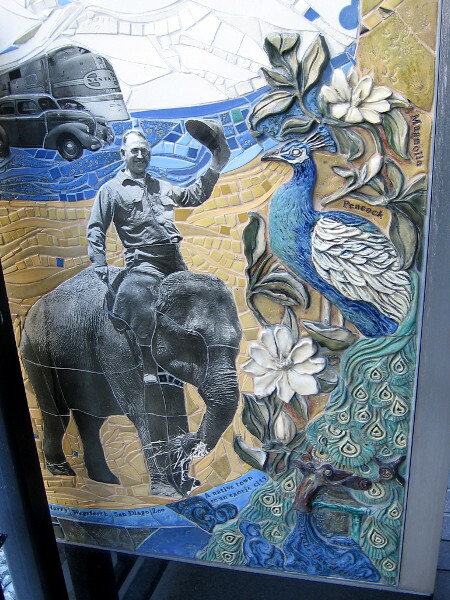 Posted on August 4, 2018 Tags art, artists, balboa park, california tower, casa del prado, history, mosaic, panama-california exposition, public art, san diego, san diego zoo, santa fe depot, tourism, travelLeave a comment on Balboa Park artwork near Santa Fe Depot. 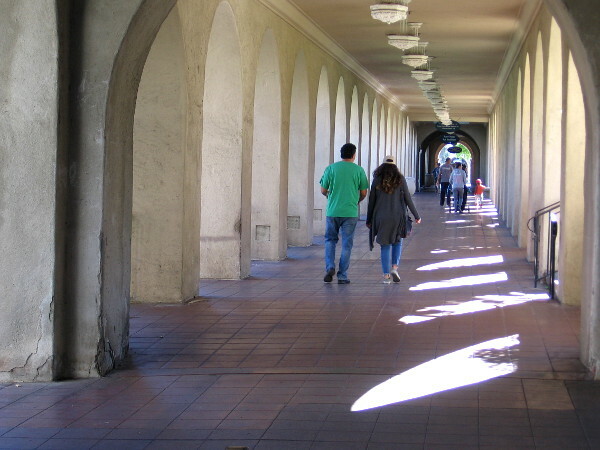 Poetic words deepen Balboa Park’s beauty. 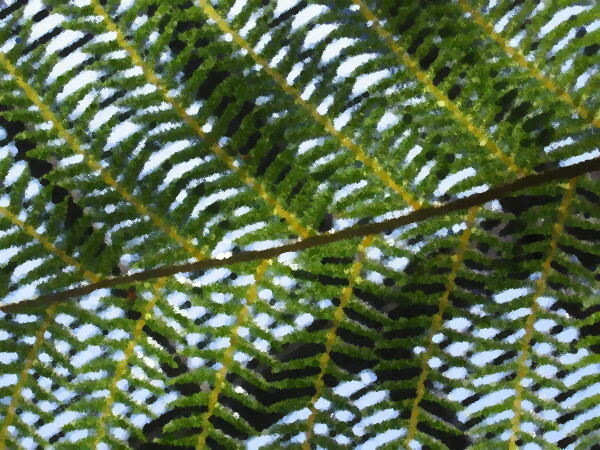 Life’s abundant riches fill Balboa Park. 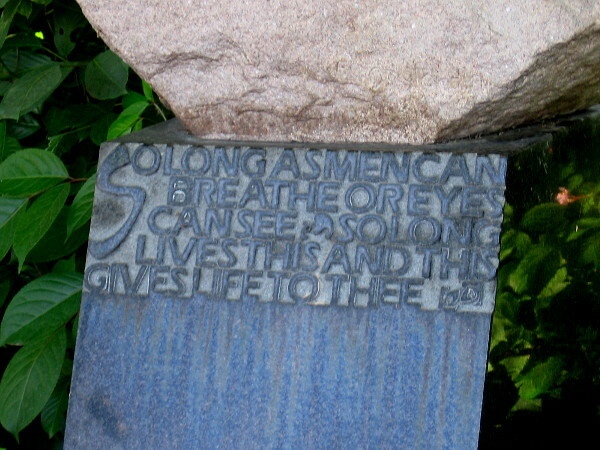 Walking about, you might happen to encounter a few poetic words. 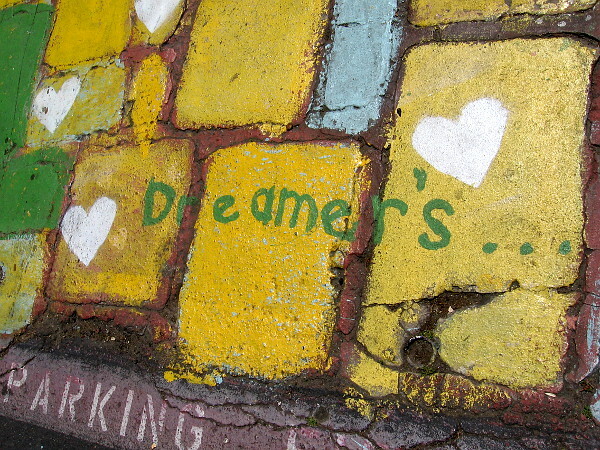 Words that express and deepen the beauty of this very special place . . . 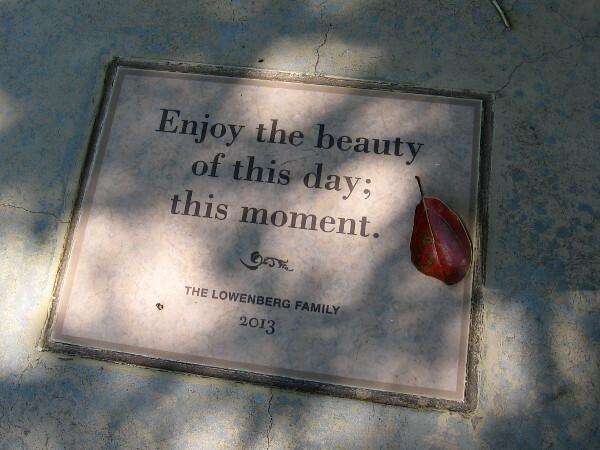 Enjoy the beauty of this day; this moment. 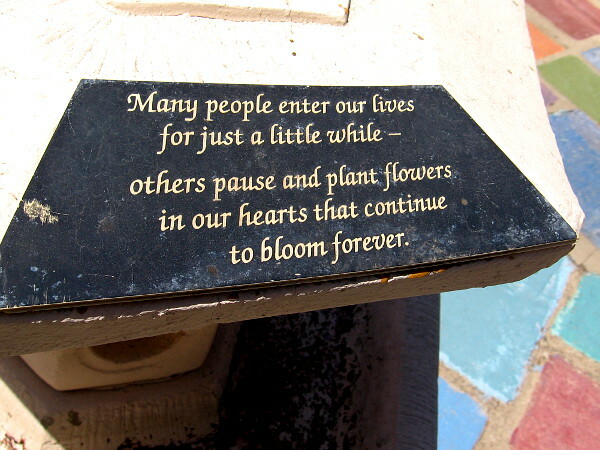 Many people enter our lives for just a little while– others pause and plant flowers in our hearts that continue to bloom forever. 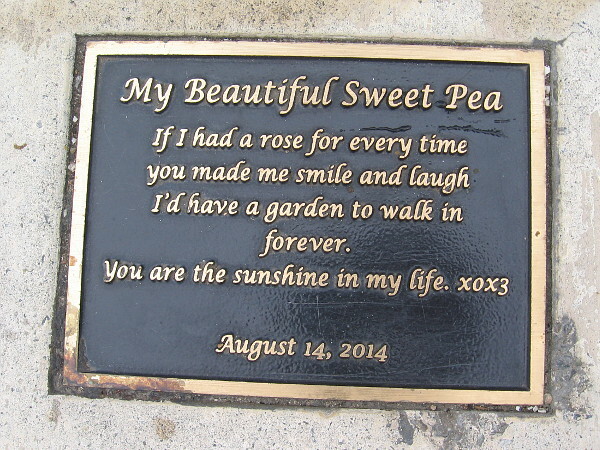 My Beautiful Sweet Pea – If I had a rose for every time you made me smile and laugh I’d have a garden to walk in forever. You are the sunshine in my life. 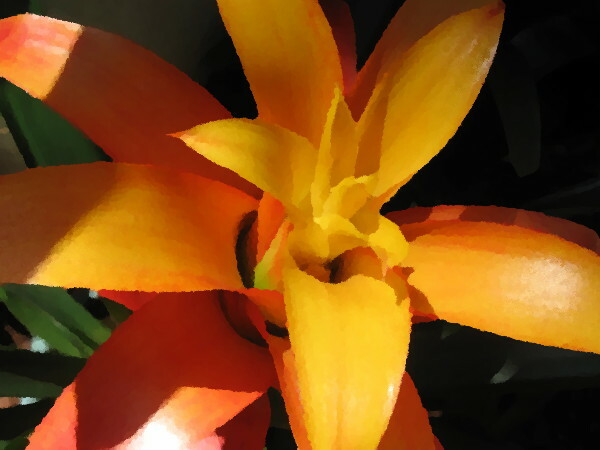 Posted on July 29, 2018 July 29, 2018 Tags art, artists, balboa park, beautiful, creativity, flowers, happy, joy, life, love, poetry, walking, wonder, writing1 Comment on Poetic words deepen Balboa Park’s beauty. 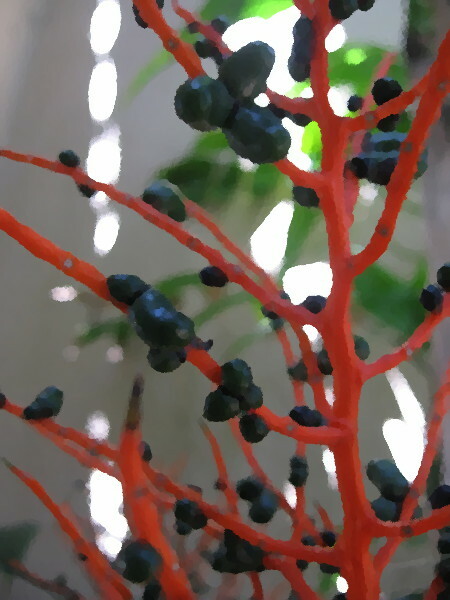 Oil painted beauty in the Botanical Building. I had some creative fun today! 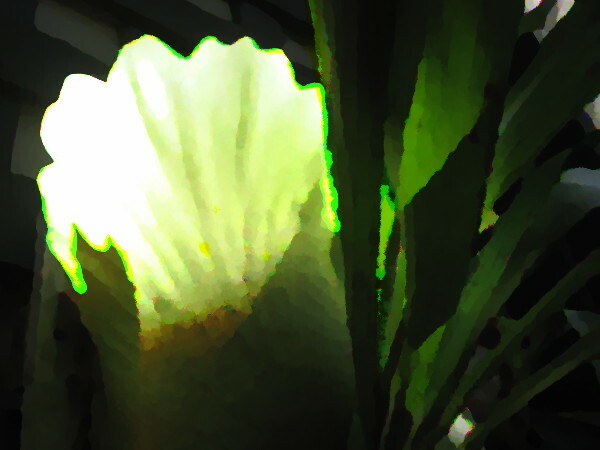 After taking a bunch of photographs in Balboa Park’s wonderful Botanical Building, I applied GIMP’s Oilify filter to selected images. 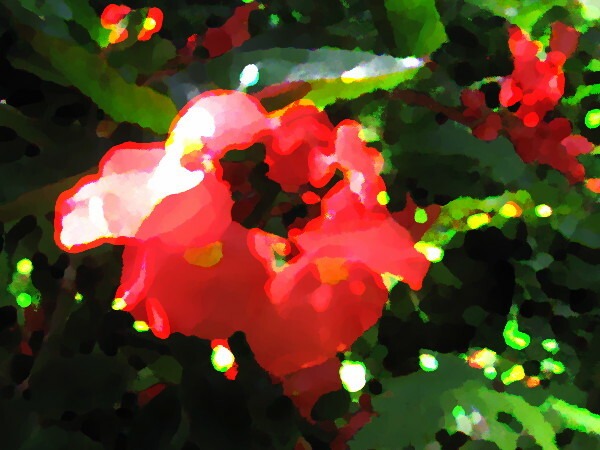 Photos of natural beauty now suddenly appear like oil paintings! 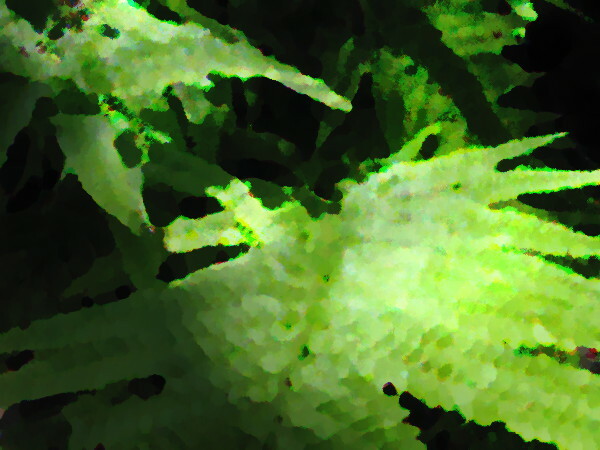 I framed leaves, flowers, color and light. My computer did the rest! 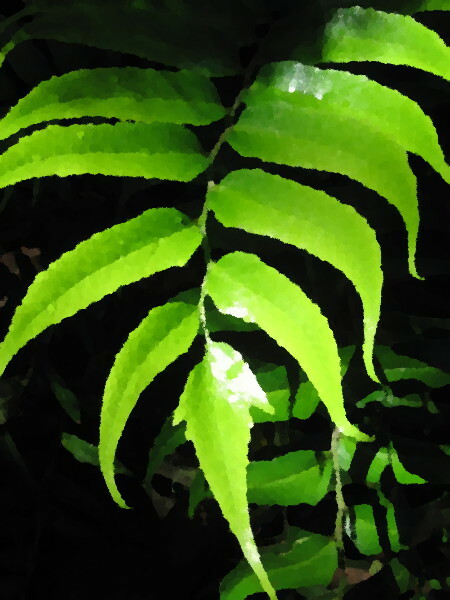 I love to take photos. 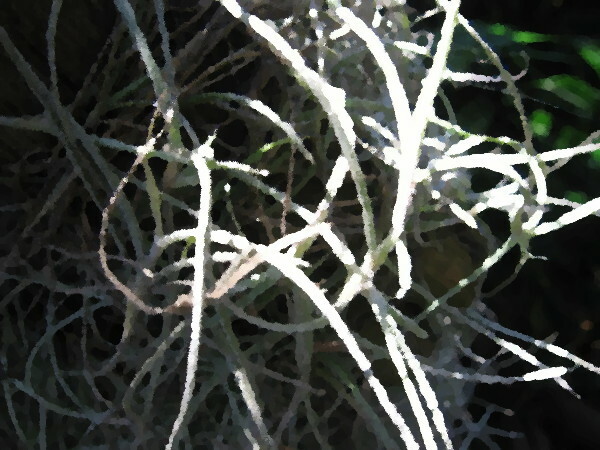 I love to discover new things. But more than anything, I love creative writing! 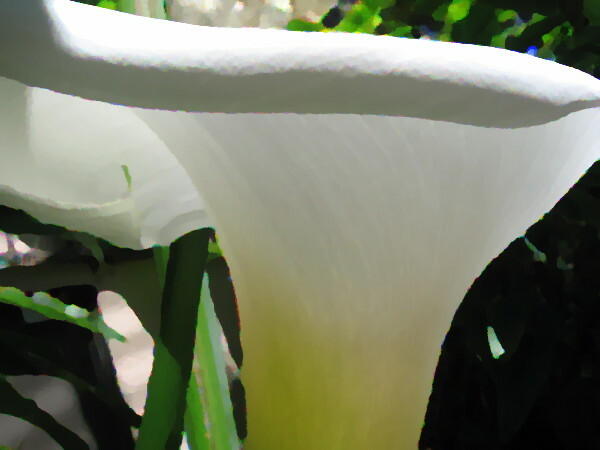 To read a few short pieces of fiction that I’ve written, you can visit my website Short Stories by Richard. 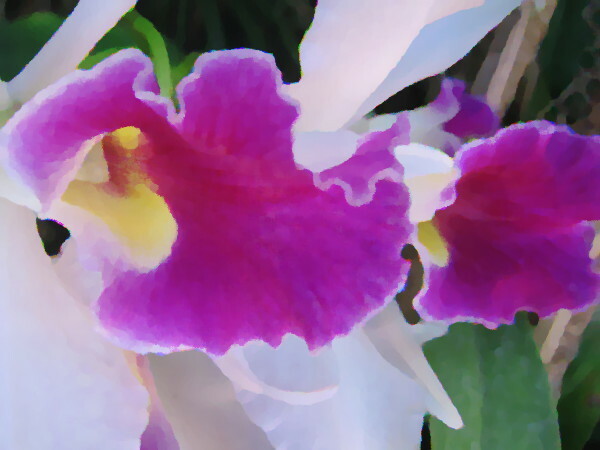 Posted on June 2, 2018 September 16, 2018 Tags art, balboa park, botanical building, color, creativity, flowers, fun, inspiration, light, nature, painting, photography, plants, technology1 Comment on Oil painted beauty in the Botanical Building. 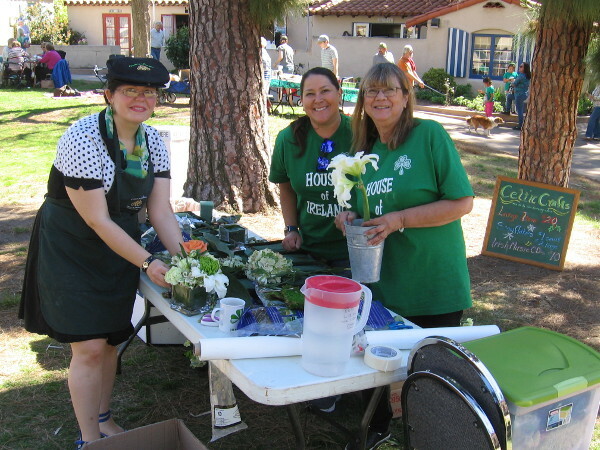 Creativity and joy thrive in Spanish Village! 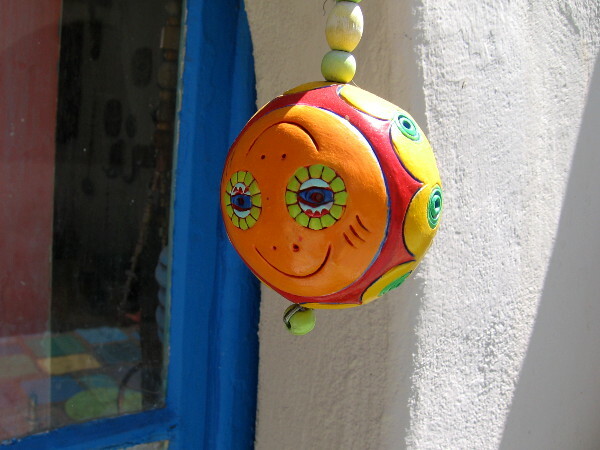 A happy orange face dangles by a studio doorway in Balboa Park’s welcoming Spanish Village Art Center. 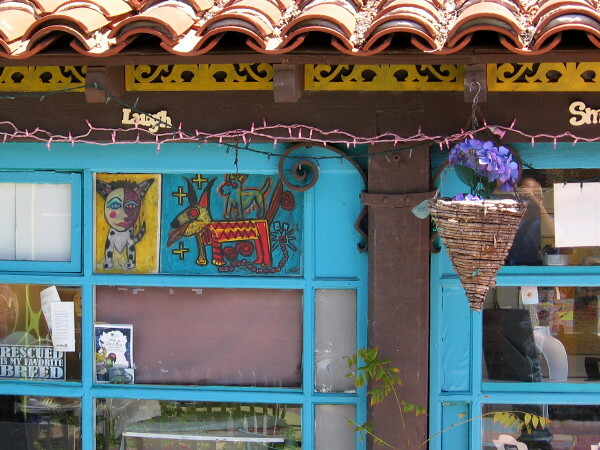 I can’t get enough of Spanish Village Art Center in Balboa Park. 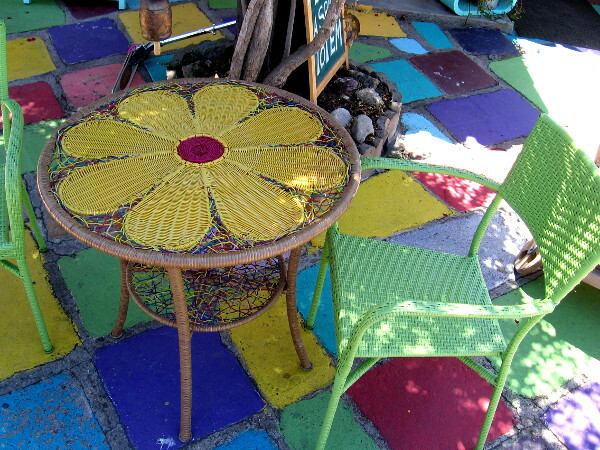 I love to meander through its colorful courtyard patio. The place is magical. 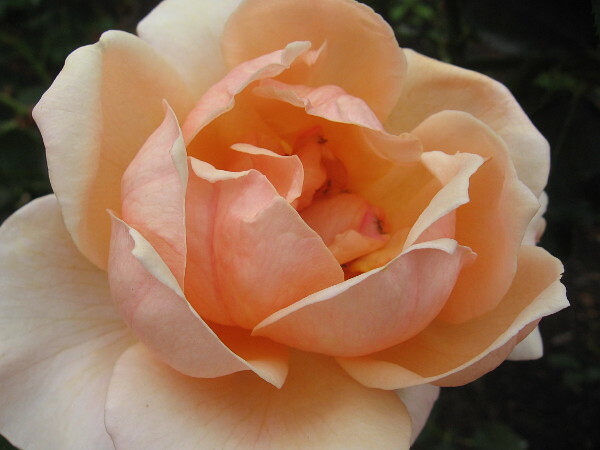 Dreamlike. 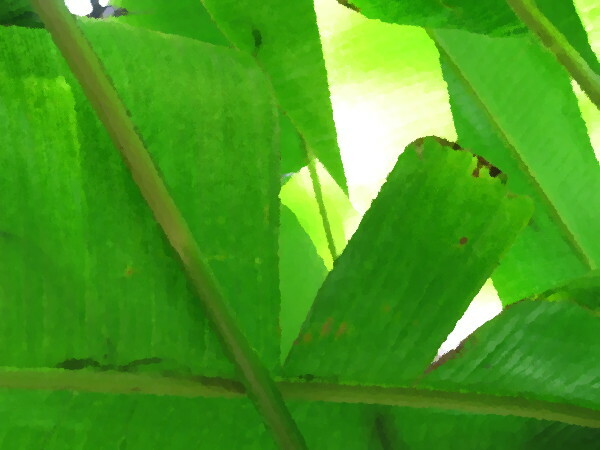 A refuge. 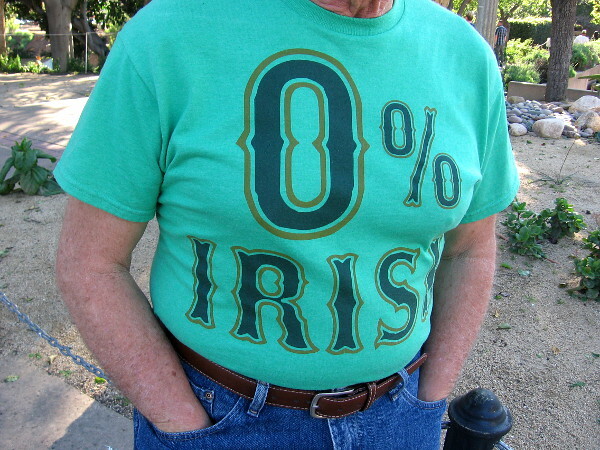 The cares of the world drop instantly away in Spanish Village. 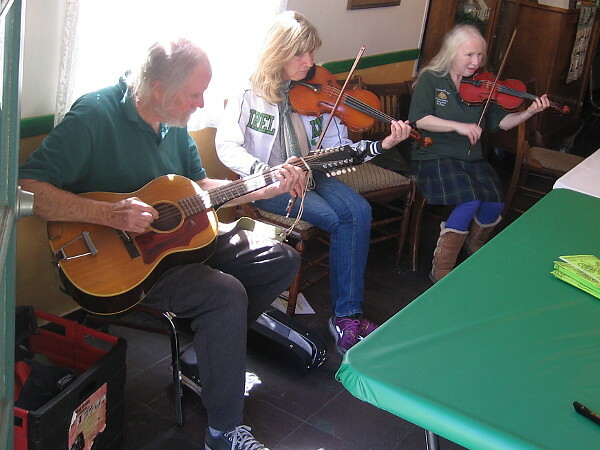 It’s a place where creativity and joy thrive! 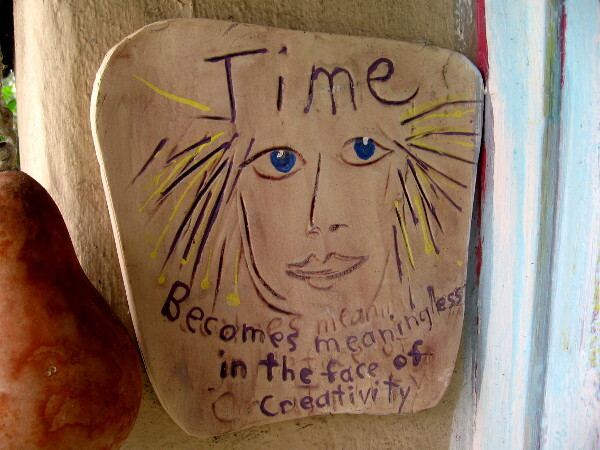 A sign tells visitors they’ve entered a joyful world where creativity thrives. 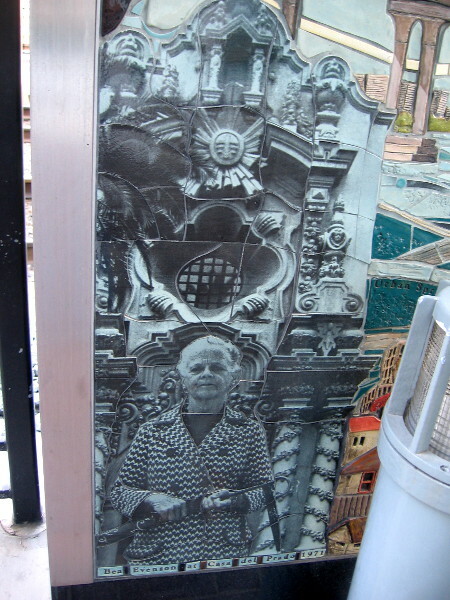 Walking through Spanish Village, with fanciful architecture inspired by southern Spain, created for the 1935 California Pacific International Exposition in Balboa Park. 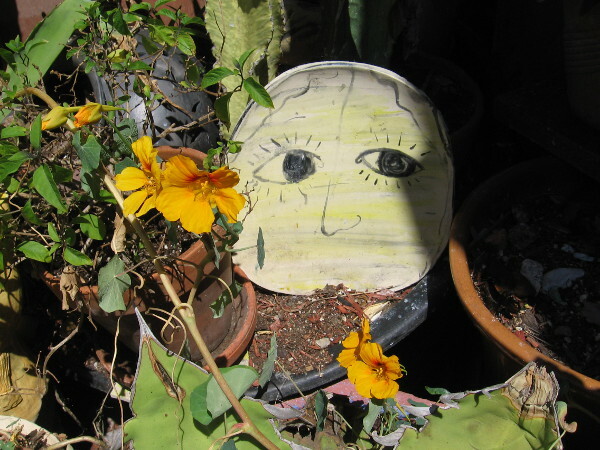 A bright face peeks out from behind flowers near Studio 13. 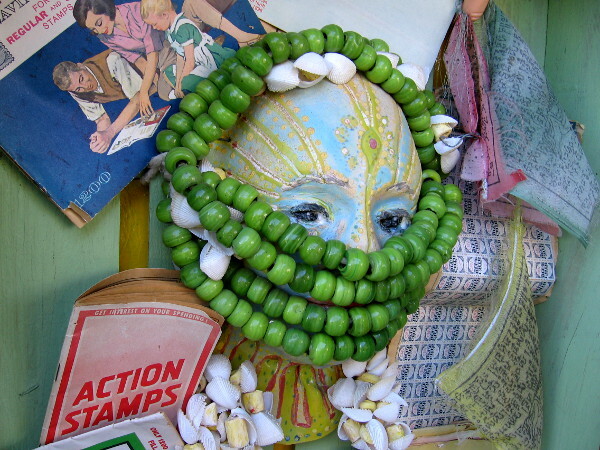 A fun work of art hangs near the entrance to Studio 15, home of Doug Snider Ceramics. 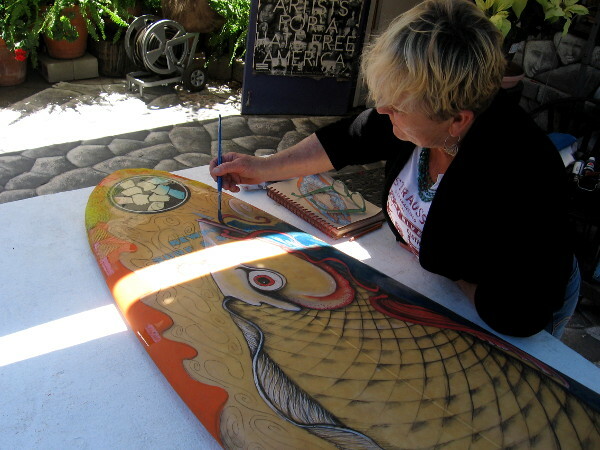 Friendly local artist paints a surfboard on the table outside Studio 10. 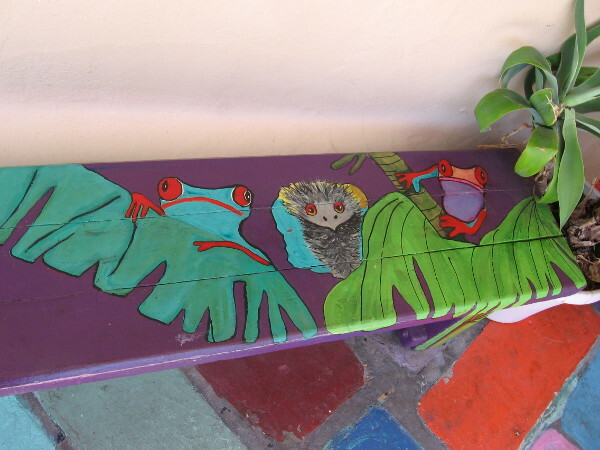 Forest creatures look up from one of several painted benches in Spanish Village. 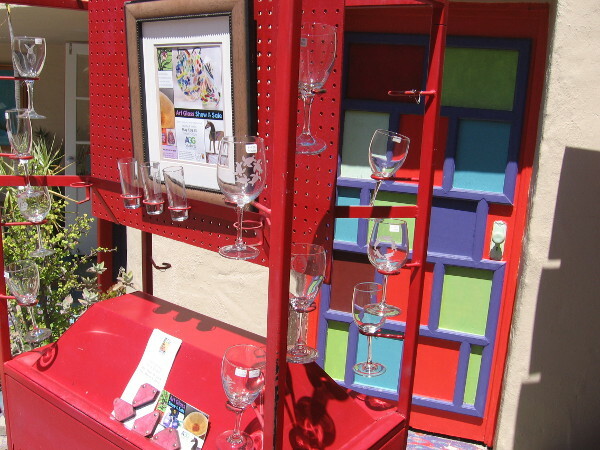 You can find this fun art in front of the Southwestern Artists Association’s Studio 23. 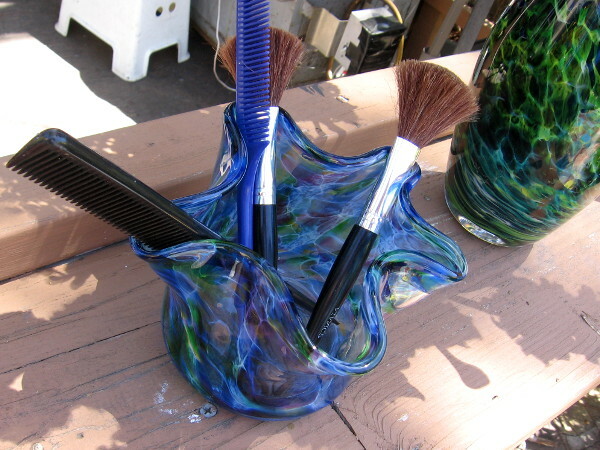 Some amazing art glass displayed outside Studio 19, where glassblowers create beauty as visitors watch. 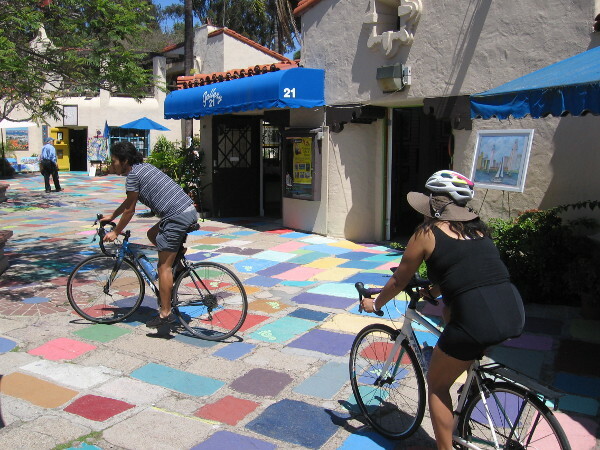 Carefree people ride bikes through sunny Spanish Village Art Center. 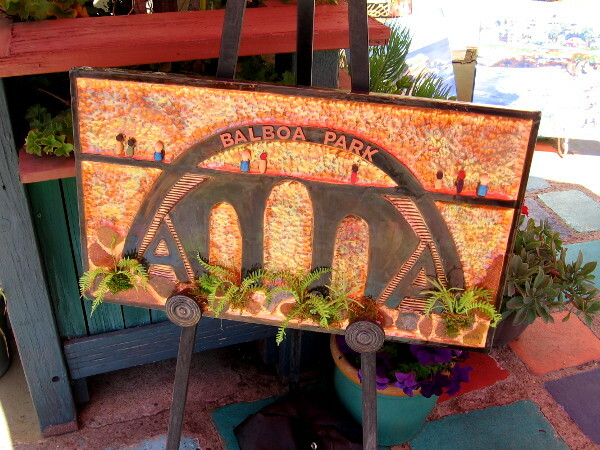 Some artwork on the patio pays tribute to beautiful Balboa Park. 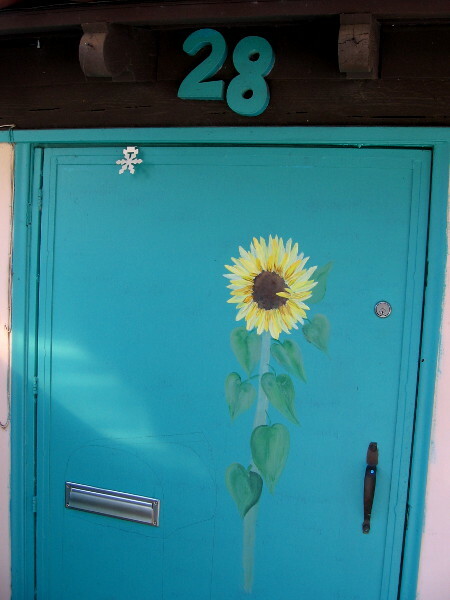 A cheerful sunflower painted on door to Studio 28. 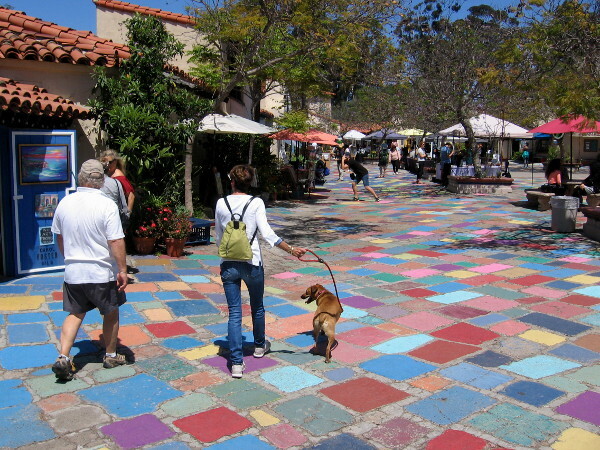 Come to Spanish Village and your eyes will be filled with surprising creativity, joy and life wherever they turn. 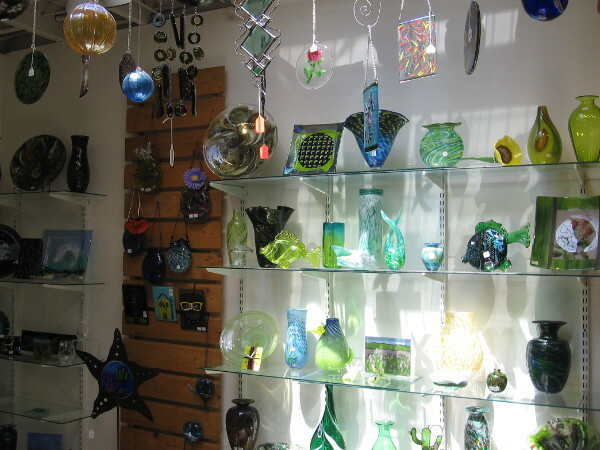 I was graciously allowed to take a photo of the art glass inside Studio 25. A skylight transforms many pieces into shining jewels. 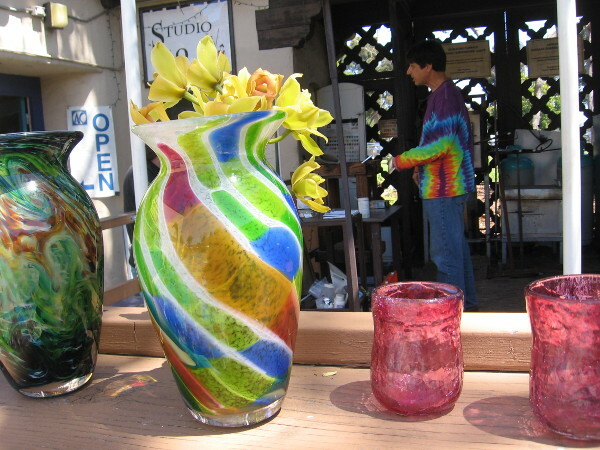 Back outside, where I took a photo of a colorful door through glassware. 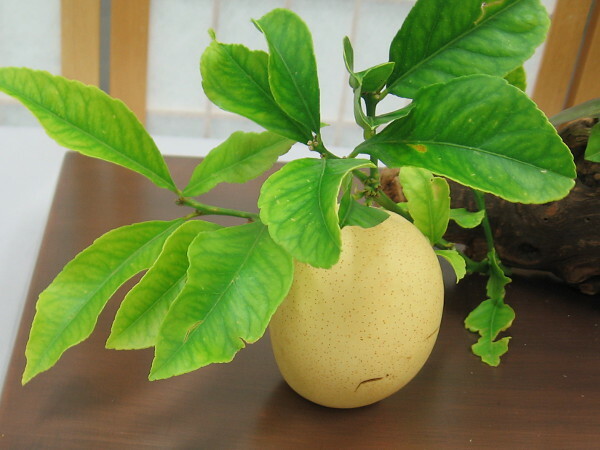 One table on the patio is like an enormous, cheerful yellow flower. 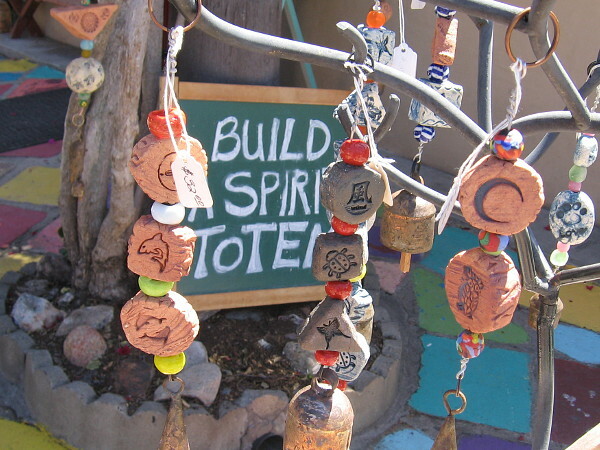 Visitors to Spanish Village Art Center are invited to build a spirit totem. 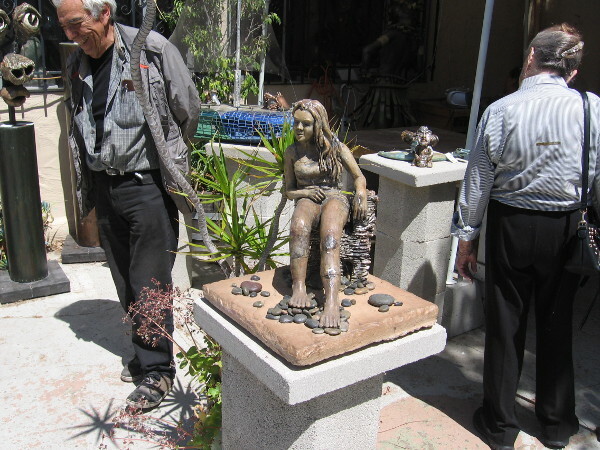 A friendly artist of the Studio 36 Sculptors Guild interacts with a potential buyer. 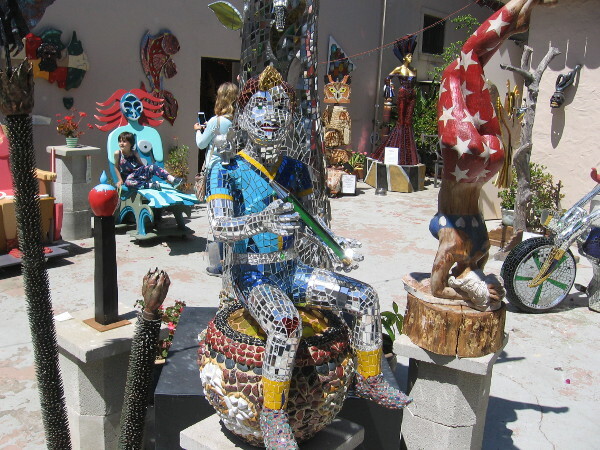 Their courtyard is overflowing with imaginative sculptures. 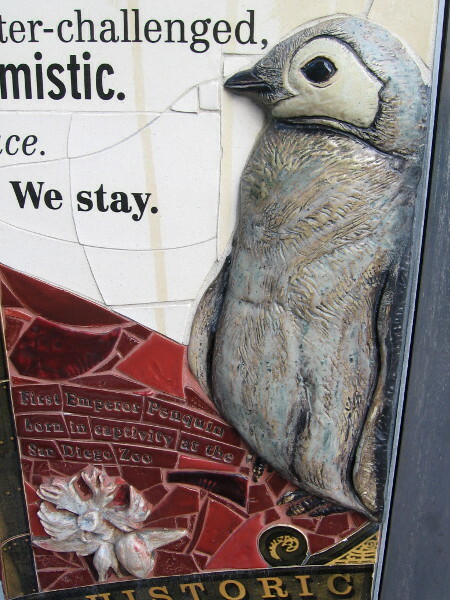 Amusing sculpted creatures greet visitors to the Studio 36 outdoor courtyard. 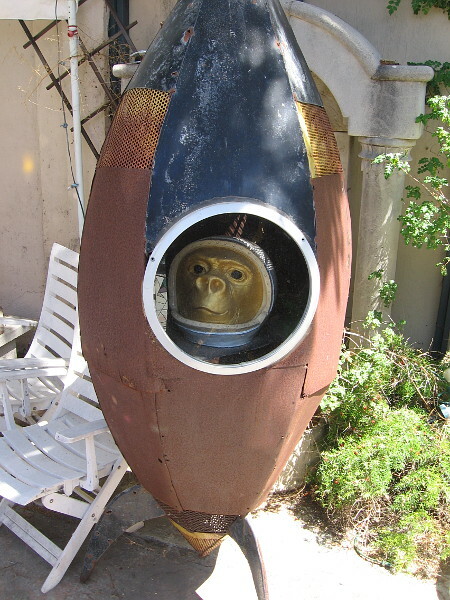 A simian in a space rocket. 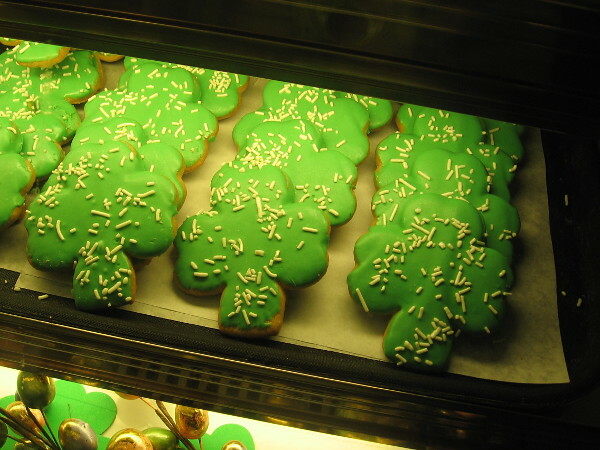 Like a joyful dream world where fantasy and imagination have come to life. 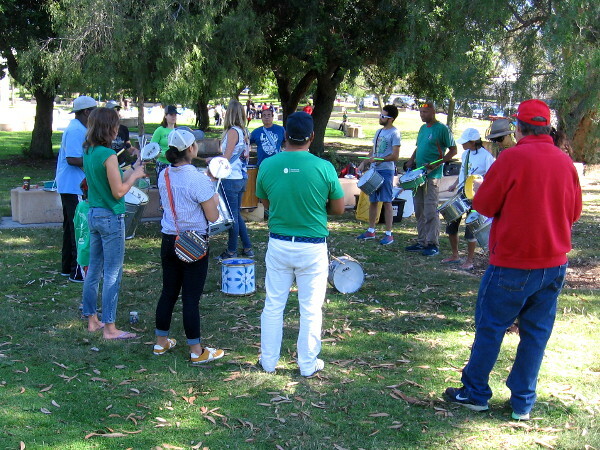 Posted on April 10, 2018 Tags art, artists, balboa park, color, creativity, dreams, happy, imagination, joy, magic, painting, photography, sculptures, spanish villageLeave a comment on Creativity and joy thrive in Spanish Village! Fine art at the San Diego History Center. 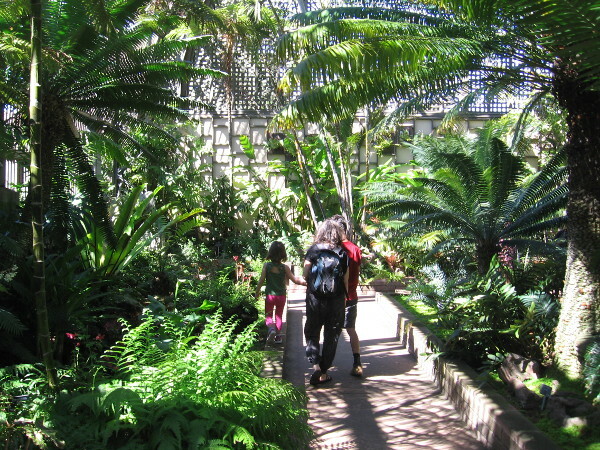 The San Diego History Center in Balboa Park has a fine art collection of more than 1700 works. 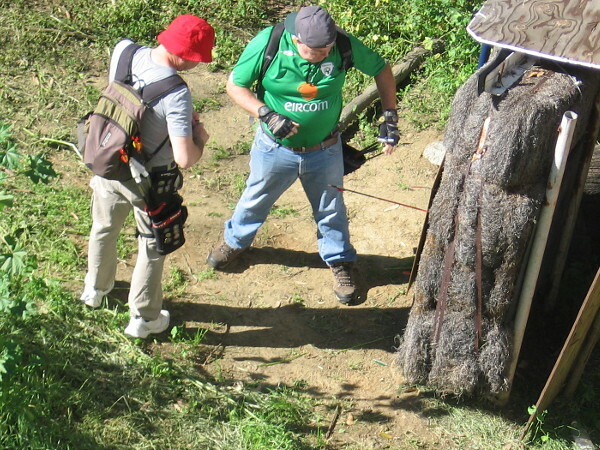 They represent the visual culture of our region. 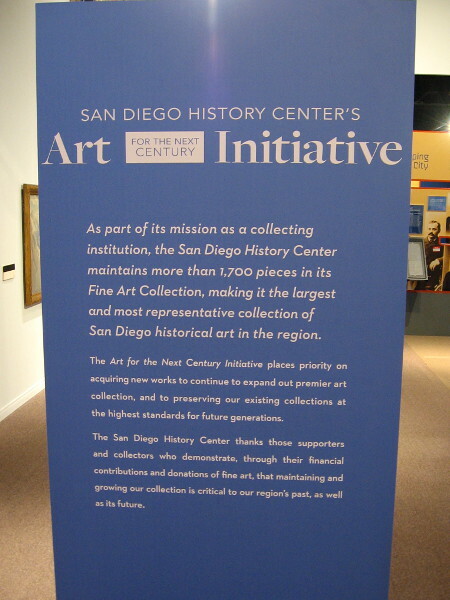 The San Diego History Center, originally the San Diego Historical Society, has been an important custodian of our region’s history since the organization’s founding in 1928 by civic leader George W. Marston. 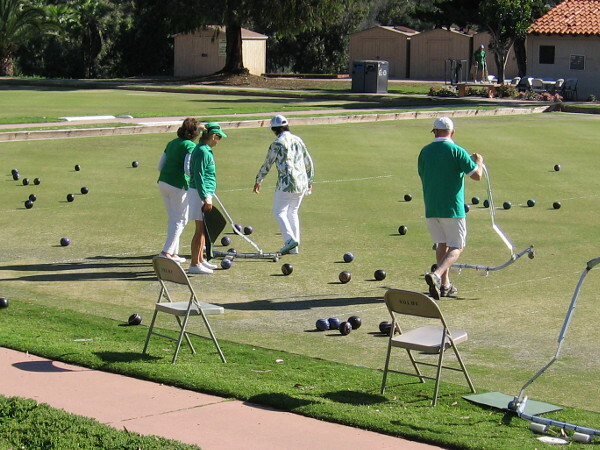 Their preserved documents, photographs and artifacts trace the development of San Diego from a small town in the desert-like wilderness to a modern, thriving Southern California metropolis. 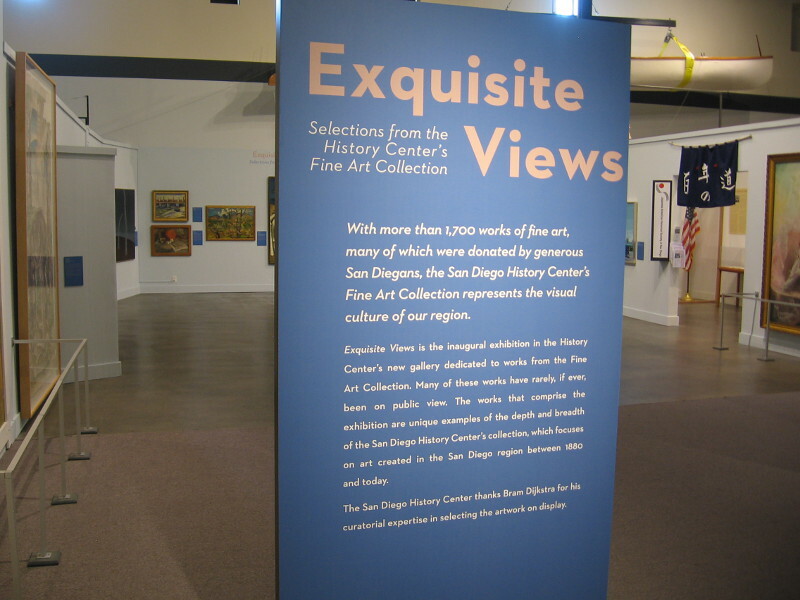 Visitors to the San Diego History Center in Balboa Park might be surprised when they enter one of the museum galleries to discover pieces from their Fine Art Collection. 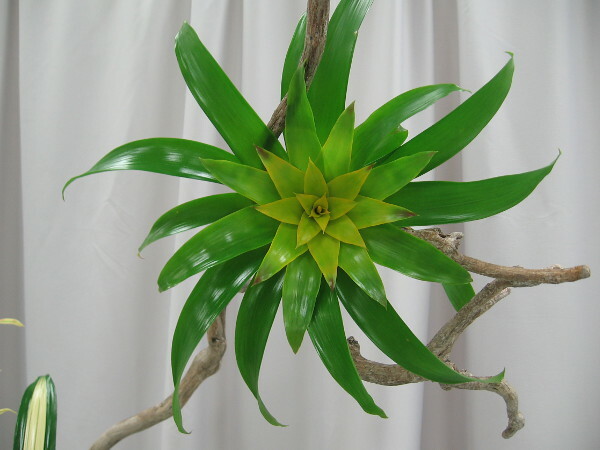 The current exhibition is titled Exquisite Views. Amazing canvases on three walls represent over 1700 pieces of fine art, many of which were donated by San Diego residents. 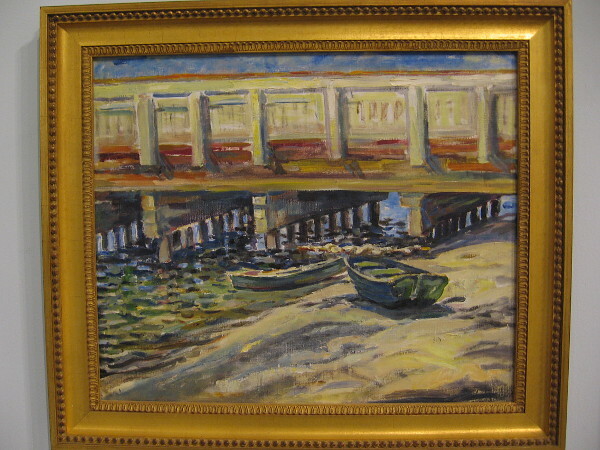 Notable artists in the large collection include James Hubbell, Maurice Braun, Alfred Mitchell, Charles Fries, Belle Baranceanu, Charles Reiffel, Alice Klauber and Donal Hord. There are two gigantic, amazing murals by Charles Reiffel on the walls of the museum nearby. And two more above stairs inside the Casa de Balboa. I posted photos of them here and here. 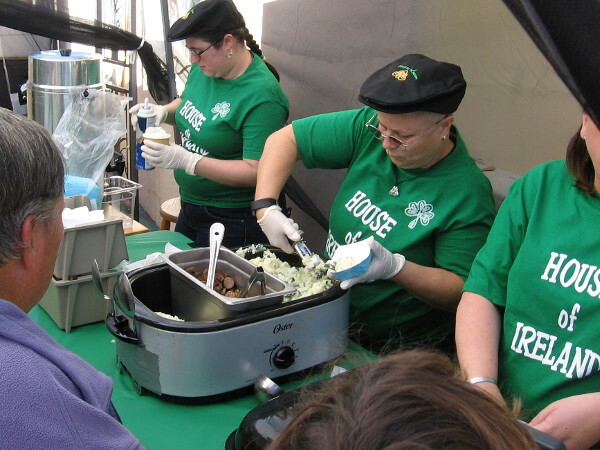 Like many cultural institutions who need support from the public, the San Diego History Center welcomes any contributions. 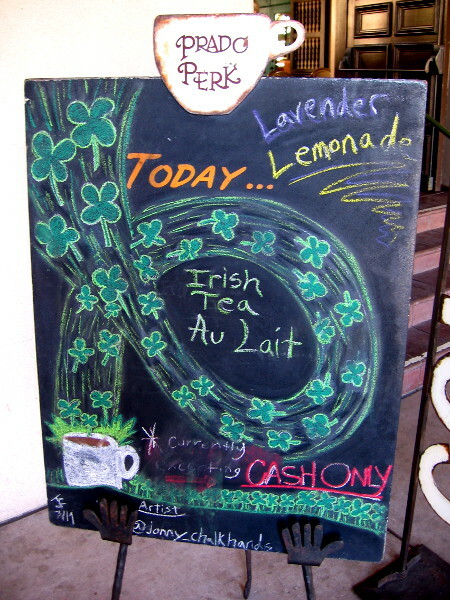 Admission to their museum in the Casa de Balboa is free, but I’m always careful to leave a donation when I visit. 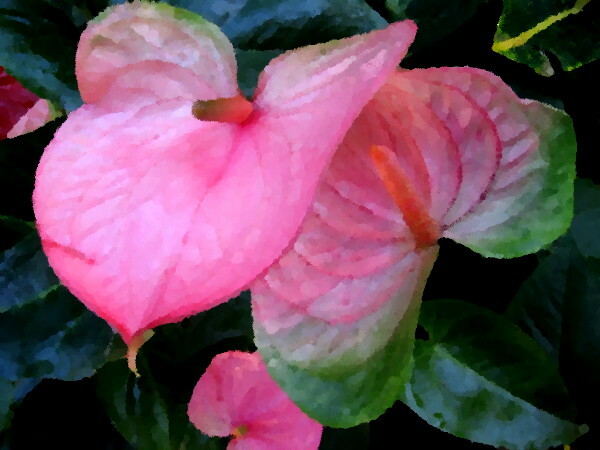 Many of their fine art pieces are also up for “adoption” by art lovers. Contact them if you are interested. The Family of Joseph W. Sefton, Sr., ca. 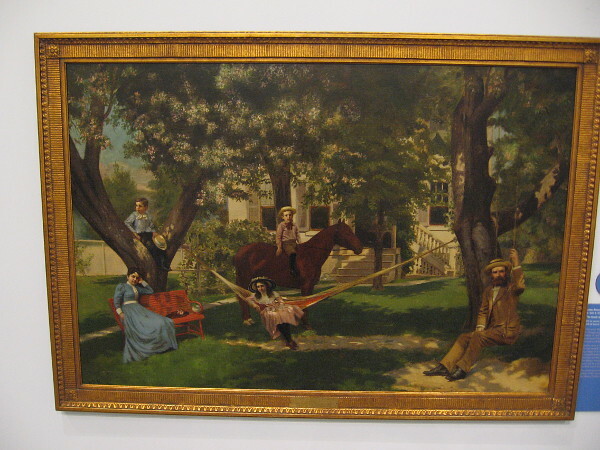 1890, oil on canvas, by artist Alden Finney Brooks. By the Sea, 1940, oil on board, by artist Dan Dickey. 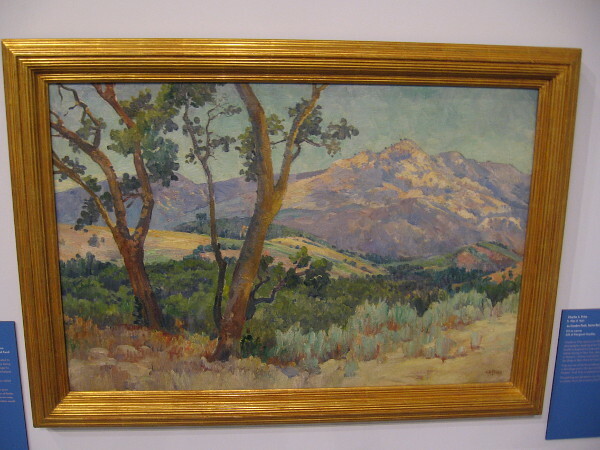 La Cumbre Peak, Santa Barbara 1918-1920, oil on canvas, by artist Charles A. Fries. 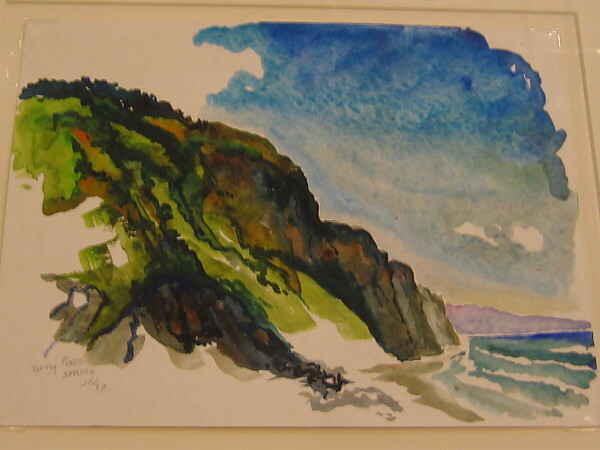 Torrey Pines – Spring, 1997, watercolor on paper, by artist James Hubbell. Untitled Landscape (Mission Bay Causeway Bridge), ca. 1930, oil on canvas, by artist Alice Klauber. Eileen, ca. 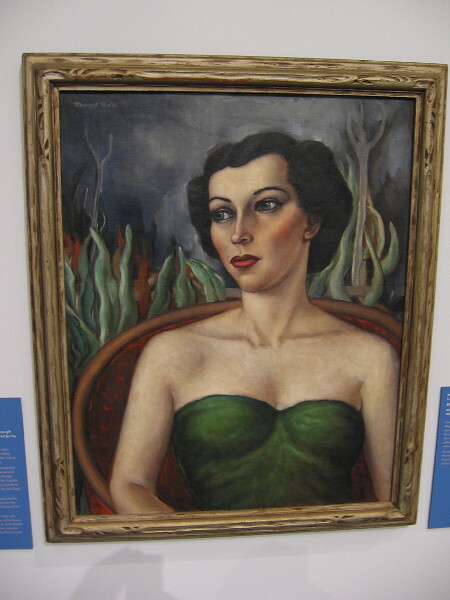 1939, oil on canvas, by artist Margaret (Margot) King Rocle. 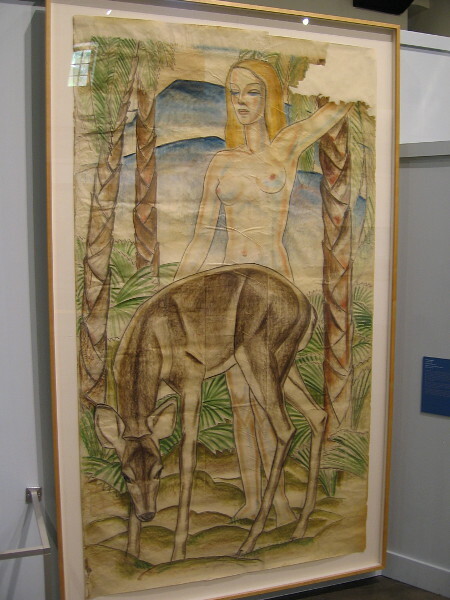 Girl with a Fawn, 1935, charcoal and colored chalk, by artist Belle Baranceanu. 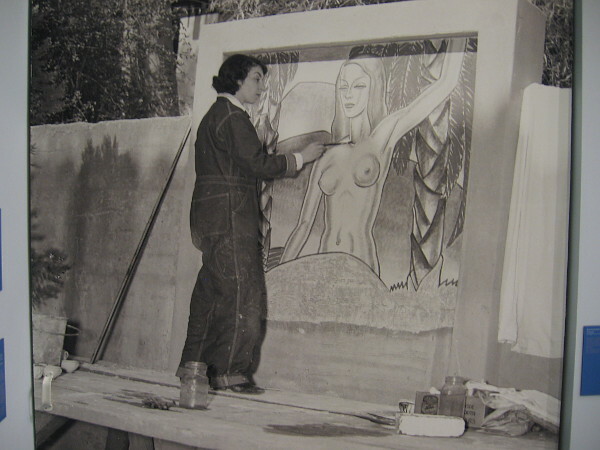 This 1935 photograph from the Union-Tribune Collection shows Belle Baranceanu painting the mural Girl with a Fawn on the east side of the Fine Arts Gallery, today’s San Diego Museum of Art. 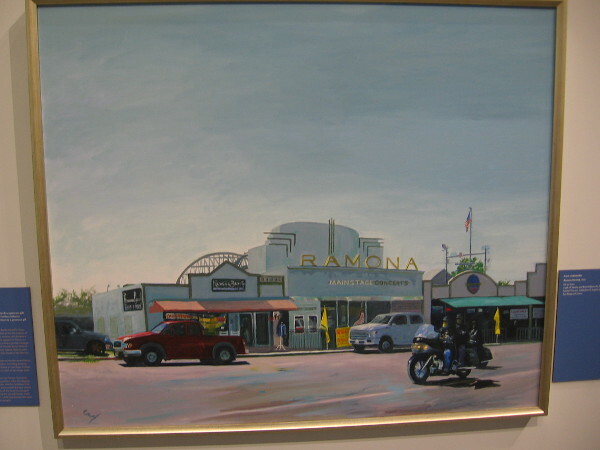 Ramona Morning, 2013, oil on linen, by artist Carol Lindemulder. 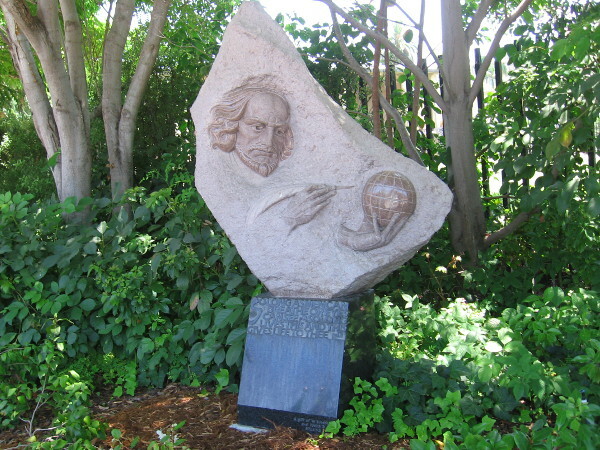 The San Diego History Center seeks to acquire new works. 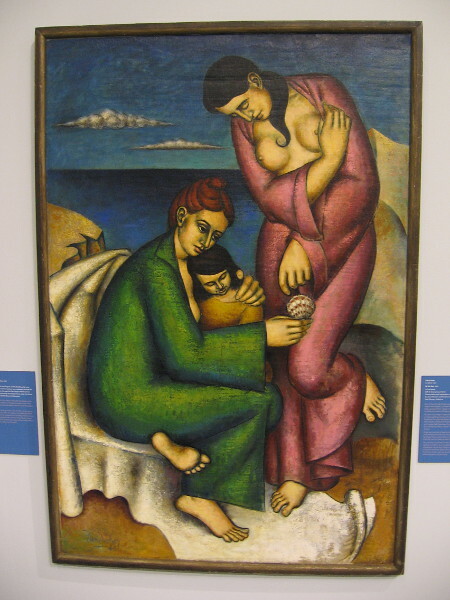 Their Art for the Next Century Initiative will expand their collection of historical artwork. 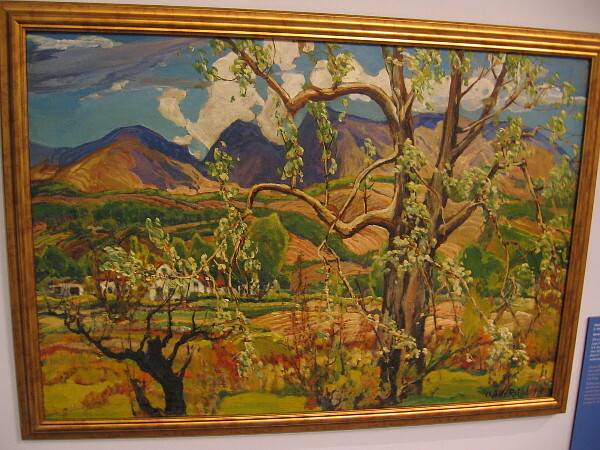 Sycamores at Springtime, 1937, oil on board, by artist Charles A. Reiffel. 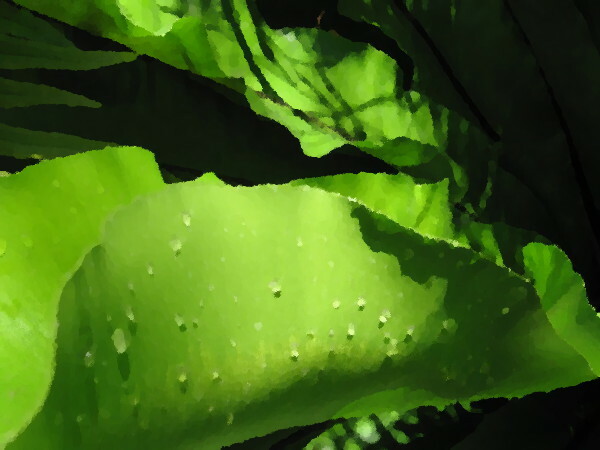 Posted on April 9, 2018 Tags art, artists, balboa park, casa de balboa, creativity, culture, fine art, history, museums, painting, san diego, san diego history center, tourism, travelLeave a comment on Fine art at the San Diego History Center. 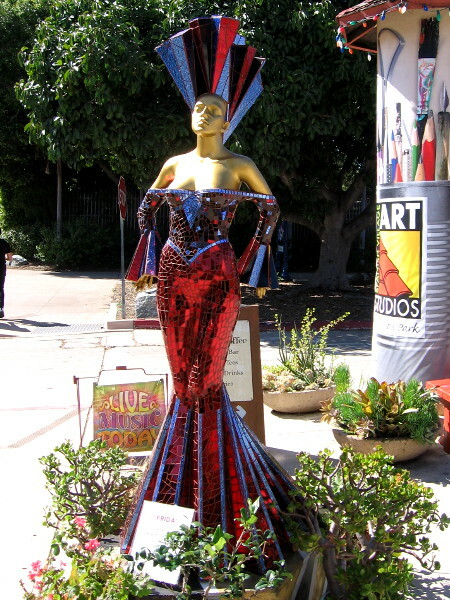 A colorful Frida Kahlo sculpture at Spanish Village! 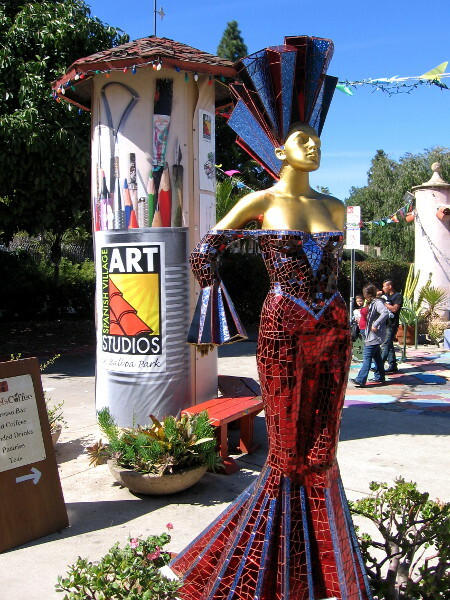 A colorful sculpture of Frida Kahlo now stands at the entrance to Spanish Village in Balboa Park! 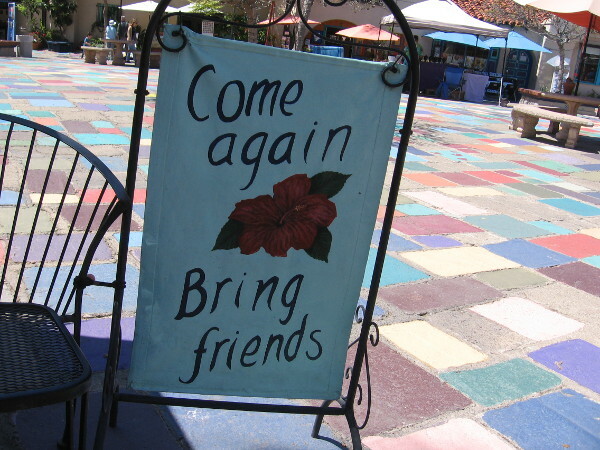 Look what recently appeared at the main entrance to Spanish Village Art Center in Balboa Park! 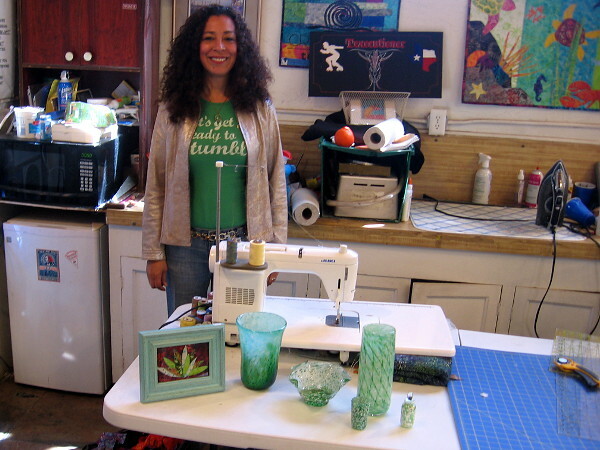 An amazing glass mosaic sculpture of Frida Kahlo! 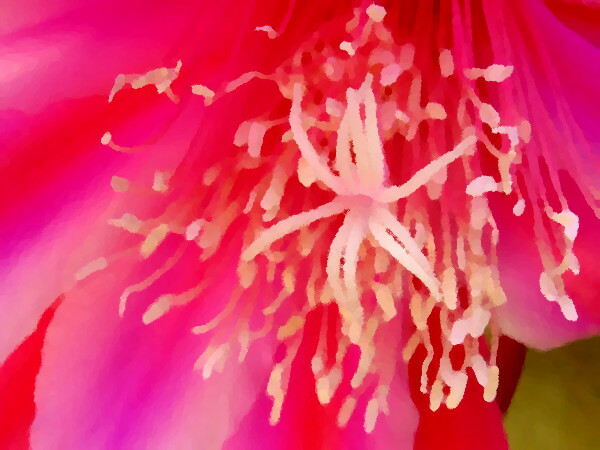 The eye-catching piece is titled Frida. It’s a collaboration between two talented artists who show their work in Spanish Village: Yuriy Akopov and Ilya Idelchik. 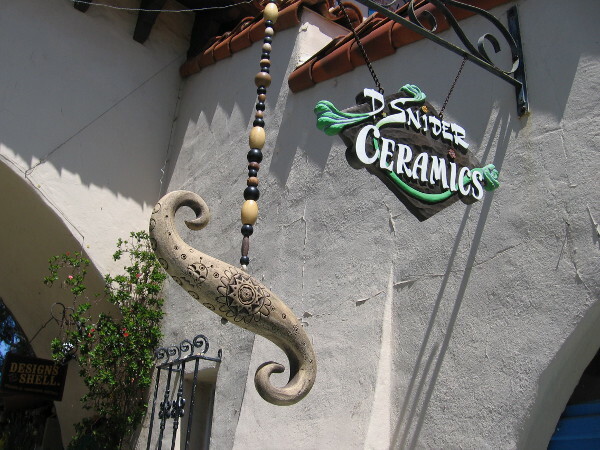 According to a nearby sign, Frida is available for purchase at the San Diego Sculptors Guild in Spanish Village’s Gallery 36. 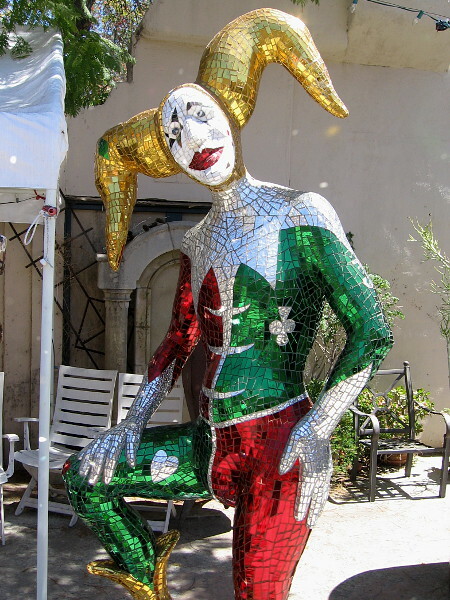 If you think this shiny, very colorful piece closely resembles the world-famous sculptures of Niki de Saint Phalle, you’re correct! 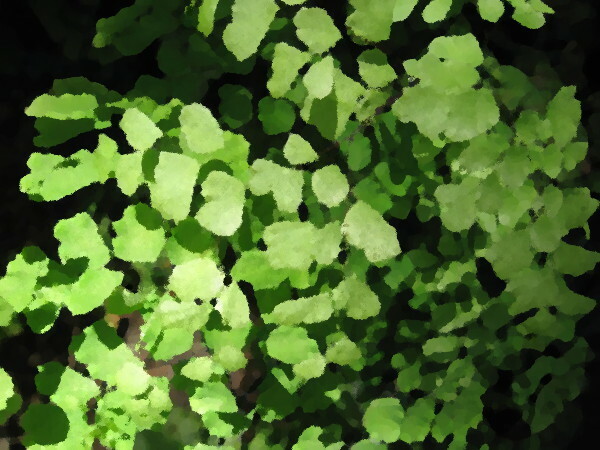 Years ago, while he worked with the company Art Mosaic, Yuriy’s own hands helped to create Niki’s fantastic artwork! 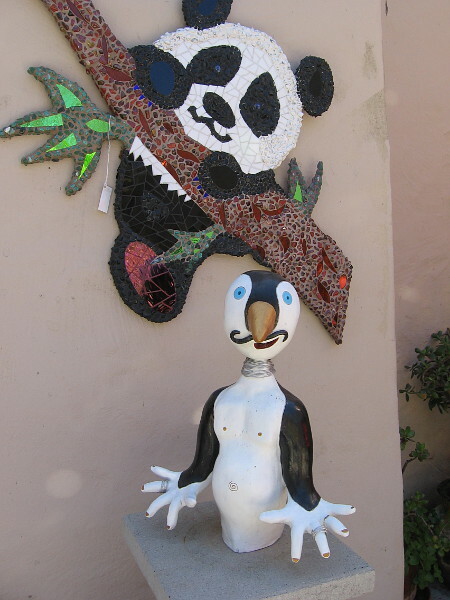 A sleek glass mosaic sculpture of Frida Kahlo greets visitors to Spanish Village Art Center! 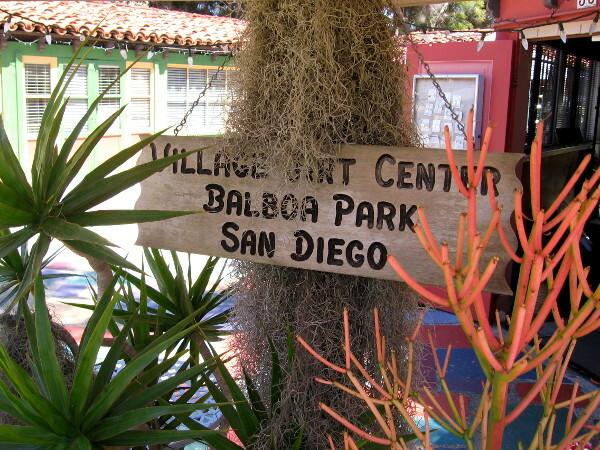 Posted on March 5, 2018 Tags amazing, art, artists, balboa park, color, creativity, culture, imagination, photography, san diego, sculptures, spanish villageLeave a comment on A colorful Frida Kahlo sculpture at Spanish Village!